Fantasia was composed in 1948 (begun in New York city and completed in Rio). Heitor Villa-Lobos, composer, guitarist and cellist, was born on March 5, 1887 in Rio de Janeiro, Brazil and died on November 17, 1959, in Rio. He lived in Paris from 1923 to 1930 before returning to Brazil. In Rio he was placed in charge of organizing Music Education in the Public Schools (1932), established a Conservatory (1942) and founded the Brazilian Academy of Music (1945), of which he was president until his death. Villa-Lobos is considered the foremost Brazilian composer of the twentieth century. His most famous compositions include the Bachianas brasileiras series, especially No. 1 & 5 for Cello ensemble. He composed a wide variety of music including: 12 Symphonies, 2 Operas, 6 Ballets, 2 film scores (Descobrimento do Brasil 1937 & Green Mansions 1958), many Symphonic Poems, Suites and Concertos, and a large quantity of Choral and Chamber works. Villa-Lobos did not use opus numbers for his compositions, so they are now identified by W(estport) numbers - from Heitor Villa-Lobos: A Bio-Bibliography by David P. Appleby (Westport, Connecticut, 1958)- Fantasia is W490. 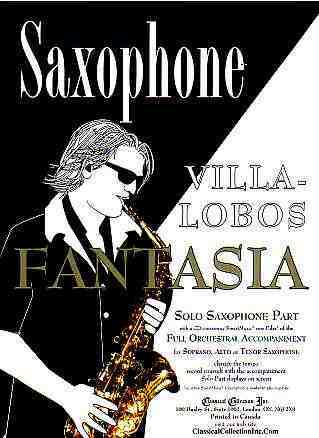 Fantasia was originally written for Soprano Saxophone and Chamber Orchestra (consisting of 3 Horns and Strings) in F Concert and dedicated to French Saxophonist Marcel Mule (1901-2001). Mule declined the offer to play it, and it was first performed by Villa-Lobos’ friend Waldnemar Szpilman (born 1911 in Poland) on Tenor Saxophone (because Szpilman didn’t own a Soprano Saxophone), lowered a tone to Eb Concert (because Szpilman didn’t want to play notes above the standard range) in Rio on November 17, 1951, with Villa-Lobos conducting. The transposition down a tone from F to Eb Concert is the probable explanation for the large number of wrong notes in many published versions of both the piano reduction and the score (2nd Violin and Viola often going too low, out of the range) - hopefully, all have been corrected in this edition. To make this work more accessible to all saxophonists, in addition to Soprano and Tenor Saxophone, SmartMusic smp files have also been provided for Alto Saxophone (by transposing the entire orchestra) for the purpose of rehearsal.